For the past eight years, members of the University of Notre Dame men’s lacrosse team have crawled from bed at the crack of dawn to travel to a South Bend Community School Corp. middle school to serve as mentors for 25 seventh- and eighth-grade boys in need of positive role models. 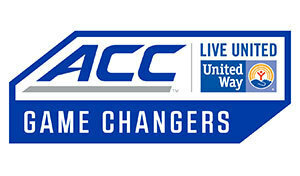 For this longstanding and significant work in the community, the Irish student-athletes have been selected as the inaugural Atlantic Coast Conference/United Way “Game Changers.” They will be honored at halftime of the New York Life ACC Tournament men’s basketball championship game Saturday night (March 14) in Greensboro, North Carolina. The “Game Changers” initiative was introduced this year as part of the Atlantic Coast Conference’s partnership with United Way. It seeks to recognize and highlight specific ACC team involvement with local United Way chapters. The Fighting Irish most recently have partnered with Dickinson Fine Arts Academy (DFAA), where administrators and teachers selected boys to participate with the hope that additional positive role models will improve their aspirations, resiliency and school performance. One morning a week, the Notre Dame student-athletes arrive at DFAA at 7:30 to meet with and engage the students in activities that center on sportsmanship, critical thinking skills and self-motivation. During the spring semester, the Irish welcome the DFAA students to the Notre Dame campus, where the students dine with the lacrosse players, observe practices and cheer on their mentors at home games. Surveys among the DFAA youths who took part in the program indicate that they are developing higher aspirations for their collective futures. Also, improvements were demonstrated in personal and social competencies — key factors of childhood resiliency. The Notre Dame student-athletes also benefited. The men’s lacrosse coaching staff believes the regular service activity was a significant factor in building cohesion among the team and helped the Fighting Irish to an ACC championship last spring, in addition to fulfilling a key pillar of undergraduate education at the University. Originally published by Dennis Brown at news.nd.edu on March 14, 2015.